Backups will save you from all sorts of problems such as ransomware, burglary, computer failure, and simple human error like mistakenly deleting files or chapters. Dropbox provides an easy way to make an off-site backup of works in progress. 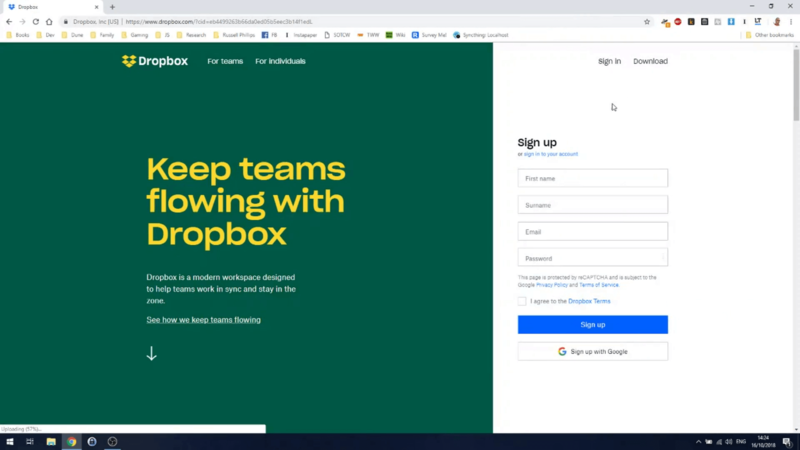 This article and video show how to set up a Dropbox account and start using it to make backups of important files. If you don’t already have one, you will need to create an account on the Dropbox.com website. To do this, go to www.dropbox.com and fill in the Sign up form. This will take you to a page where you can download the Dropbox installer. Once the installer is downloaded, run it to install Dropbox. As part of the installation, a new folder named Dropbox will be created. Anything saved in that Dropbox folder will be automatically backed up to Dropbox’s servers. Simply by working from that folder, you can ensure that your manuscript is always backed up. On the free plan, you can store up to 2GB of files. When signed in to the Dropbox website, simply click on your user icon to see how much space you are using. Changes and deleted files are kept for thirty days. If you make a mistake and need to go back to a previous version, or if you accidentally delete a file, you can restore a previous version of the file for up to thirty days. Paid plans offer more space and longer retention of changed or deleted files. Once the installer has finished, click the Open my Dropbox button and go through the introduction. 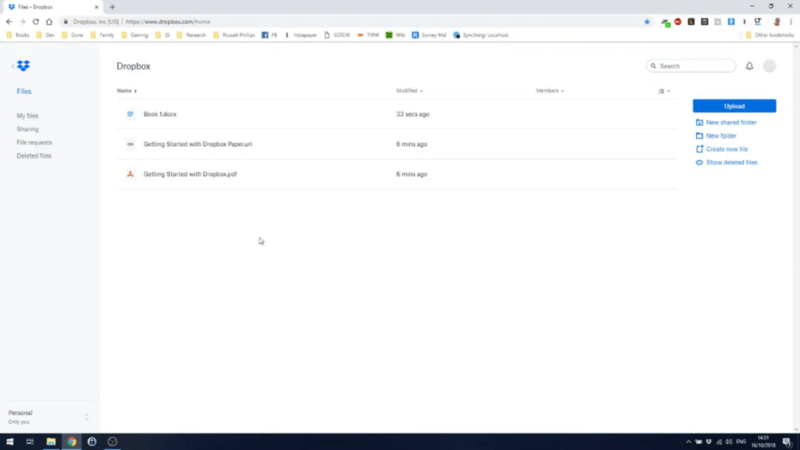 Windows Explorer will open displaying the new Dropbox folder, which will have a shortcut to a web page and a PDF. At this point, I suggest you move any work in progress to the new Dropbox folder. It will be automatically backed up. 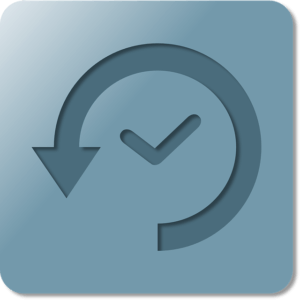 Whenever you save, the new version will be backed up and old versions will be kept for thirty days. This process is completely automatic and happens in the background. 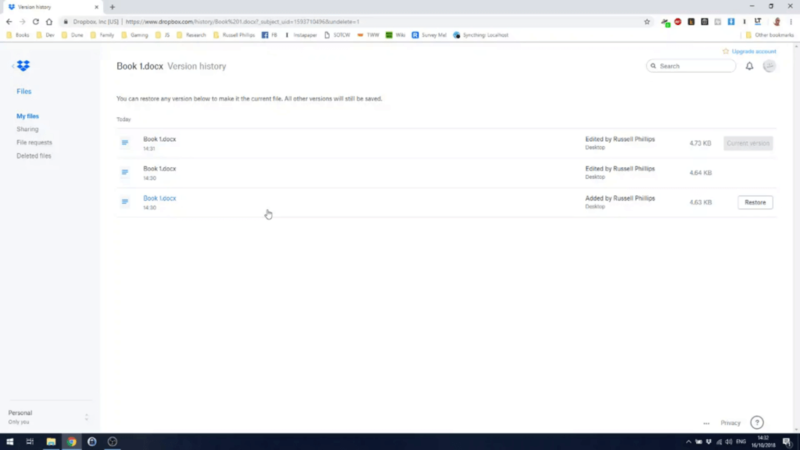 If you need to go back to an older version of a file, log in to the Dropbox website and go to the Files area, where you will see a list of your files. Click on the ellipsis menu next to a file and select Version history to see older versions. You can restore an older version by clicking Restore, or click on the file name to see a preview. From here, you can download the file, which may be useful for comparing an older version to the current version. To restore a deleted file, go to the Dropbox website and log in. On the file list page, click Show deleted files. Deleted files will now be displayed, with a rubbish bin icon and a Deleted notation. Click on the file’s ellipsis menu and select Restore. Confirm, and the file will be restored and downloaded to your computer, where it will re-appear in your Dropbox folder. 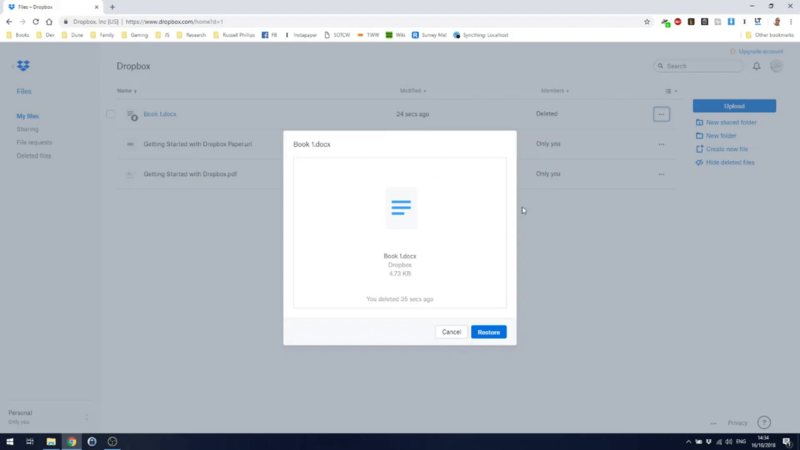 The video below is a screencast, showing Dropbox being used to save, backup, and restore files. If you need help with installing Dropbox or setting up a complete backup solution, email me. © Author Help 2018. Author Help is a division of Shilka Publishing.